If you're not familiar with the term effective rights, it refers to the calculated rights that result from the number of different permission settings applied via group memberships, nested groups, hierarchical permissions, object ownership, and other considerations. NetVision's latest product is now available in a Single Server Edition (SSE) to provide effective rights reporting on (you guessed it) a single server for a very reasonable price ($795 per server). Give Access Rights Inspector SSE a free trial on your own server. If you decide to buy, use the promo code "access10" until Dec 31, 2009 to get $300 off the price and pay only $495 to generate an unlimited number of effective rights reports on a single Windows Server. This can save an enormous amount of time during security audits. We're looking for affiliates. Post a link from your blog and get 15% for each sale. That's ~$120 at full price. If you're lucky, you'll make that in a year with Google Adwords. Sell a dozen servers and you'll be picking out a brand new flat screen TV (maybe one of those backlit LED displays) ...or maybe making a down payment on a new car? It's easy. And it's a useful product. Give it a try for yourself and let me know if you're interested. This is a great how-to article on querying Active Directory from within SQL Server. I've written in the past about using Virtual Directory technology to query SQL data via LDAP. This is the reverse and I can envision many use-cases where this would be useful. This isn't exactly new technology, but it's a new write-up on how it's done and very easy to follow. For example, you could use this approach to extend the information available to an application without doing any data synchronization or introducing new data sources. If the application's logon ID is the user's email address, you could query AD based on that email and get info about the user's group memberships, attributes, manager, location, etc. and have that returned to the application as if the data were stored in the local app's database. ...another useful approach to keep in your development toolbox. Two Factor Authentication is Worth Nothing? Apparently, Roger Dean, executive director of EEMA, recently declared two-factor authentication “not worth anything anymore.” According to the article, Dean's thinking is that man in the middle (MITM) attacks render strong authentication useless. Isn't that like claiming that firewalls are worthless because they don't prevent viruses from being installed on desktops? Strong authentication (which includes two-factor) was never intended to prevent MITM attacks. That problem was already (theoretically) solved with SSL. Perhaps Dean was reading Bruce Schneier's thoughts from back in 2005. I get it. Issuing tokens to users is not a panacea. But, there is no cure-all in the security space. We rely on SSL to establish secure links to sites, which should both identify the site as being who it says and prevent snooping. Theoretically, that end-to-end encryption and use of trusted certificate authorities is what would prevent MITM attacks. But even when using SSL correctly (and assuming there are no flaws in SSL), there is still an authentication challenge that strong authentication techniques such as two-factor rise to meet. Without it, users may share credentials or use weak passwords exposing numerous other potential attack vectors. I think Dean's frustration is focused in the wrong direction. Strong authentication techniques are good at what they do and (still) have their place in the security infrastructure. I think the problem he's seeing mainly lies in the user interface of SSL. Like any good security feature should, it does a good job of staying transparent to the end user. But a little too good. So good, in fact, that most users don't even know when it's not there. And that's the problem. If we could force users to look for and expect the SSL connection and to confirm the domain with which they're connected, phishing and MITM would become immediately unprofitable. I'm surprised browser vendors haven't done that yet (and EV certificates are not the answer). Personally, I'd want to see a white list approach for personal banking and other regular-use sites coupled with a per-use hoop to jump through for occasional other data transfers. But don't blame strong authentication for SSL's incompetence. Yesterday, RSA and Verisign announced a partnership on cloud-based secure authentication for the consumer market. Pretty interesting stuff. The management of these organizations should be commended for looking past their competitive rivalry to identify a new business opportunity. The solution isn't new. Verisign has been offering its VeriSign Identity Protection (VIP) authentication services for quite some time. I've had a token that I use with my PayPal account (and my OpenID) for the past couple of years (made in China by ActiveIdentity). But adoption of the offering has been less than overwhelming. We could probably all count on one hand the number of people we know with a non-work-based authentication token. And most of those are likely tokens handed out by banks and other financial companies that are tied to a single account. The VIP solution gives you a token to use across multiple sites. And there are a few other perks as well. I don't know what they charge to add this strong authentication to your site. But, I expect that it's more competitive than implementing your own solution. And the end-users benefit from a single token that can be used across systems. RSA hasn't been wildly successful in getting tokens into the hands of consumers. So, partnering with Verisign seems like a good move - leverage an existing solution to sell more product. And Verisign customers benefit from more choice. RSA has a lot of token options and some are impressive. Their manufacturing is done at their headquarters in MA and the quality assurance process is top rate (I've been through the tour). In addition to overall quality, some provide additional convenience as well such as a token with an integrated smart chip (for access to encrypted laptops and digital signing) or the software tokens for BlackBerry, iPhone, Win Mobile, etc. that don't require an additional piece of hardware. I should note that the release only mentions hardware tokens, but in the consumer market, it would be a bad move to restrict usage to hardware only. I posted recently about identity in the cloud. Many identity vendors are doing interesting things to get their solutions 'in the cloud' or available 'as a service'. It's a lot of buzz, but there's also some actual cost savings and operational efficiencies at the bottom of these efforts. Today, Optimal IdM announced their cloud provisioning solution. Similar to what Identropy is doing with IC2, Optimal IdM's solution leverages existing provisioning solutions and acts as a connector to cloud applications. This use case of acting as a connector for remote, unknown, complex, or varied systems is a perfect fit for virtual directory technology. MaXware released a similar connector for Salesforce in 2006 while I was still an employee. Perhaps they were ahead of their time? The virtual directory solution can be added to virtually (no pun intended) any environment and provide immediate connections up to numerous, complex cloud systems, thus saving cost and effort as compared to developing custom connectors. Having said all those nice things about the virtual directory approach and once again encouraging IAM integrators to consider virtual directory solutions while whiteboarding on how to meet requirements, I should be fair and point out an alternate viewpoint. If you already have a provisioning solution from the likes of Courion, Novell, Oracle or IBM, and a requirement to provision to cloud applications, you owe it to yourself to take a close look at Identropy's IC2 offering before making any purchase decisions. That's exactly what it's designed to do. Another interesting note - I spoke to someone from Arcot today (think secure token-less authentication) who informed me that all of their solutions for secure authentication are now available as a service. They already have one of the most widely deployed authentication-as-a-service solutions on the market, so it seems to be a natural migration to offer their other solutions from the cloud as well. Who recently said there was no more innovation in the IAM space? The latest innovation in this space is in direct response to the market complaints that IAM is too complex. Once simplicity is realized, innovation will no doubt trend elsewhere. I call that a success in meeting customer demand. Over the past few years, I've encountered a number of customers who were struggling with a compliance mandate requiring employees to annually acknowledge that they have read the organization's security policy, code of conduct, or other important policy. Coreblox recently outlined how you can enforce that annual acceptance using a Web Access Management solution. If you're employees regularly need to access web resources, this is a good way to force their attention as-needed. How have you solved the problem? Who has access to this file? What does this user account or group have access to? If so, take a look at this description of NetVision's latest - free reports that answer complex questions. Or to get started right away, go directly to the TryIt! edition product page. It's nice to have something free to give away that is actually useful. Direct User Assignments – report on all instances of permissions being assigned directly to user accounts (instead of via groups). Explicit Deny Entries – report on all instances of explicitly denied permissions (these can cause headaches when trying to figure out why someone doesn't have expected permissions). 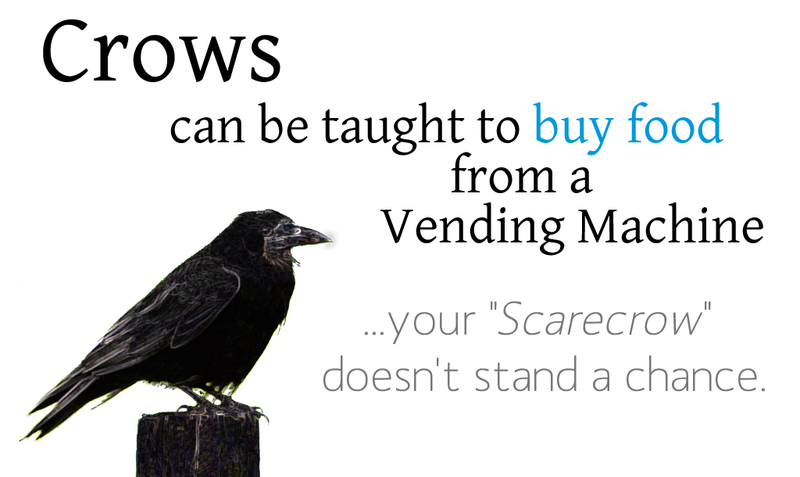 As reported in the NY Times, researcher Josh Klein actually taught crows to buy their own food from vending machines. If you have 10 minutes, the TED presentation is definitely worth watching. Crows are way more intelligent than you would think. And we think we can stop them with an inanimate pile of clothes stuffed with hay! Of course, there's a lesson to be learned for information security practicioners. Your company's employees and system adminstrators will learn and adapt. They can see the scarecrow that you've put in place to ensure security. And they figure out how work around it. 53% [of employees] have felt the need to work around IT security policies in order to get their work done. Those are well-meaning employees just trying to do their best for the company. A recent NetworkWorld article titled Inside a data leak audit provides a real-world example. It describes an organization that was seemingly doing everything right with regard to information security. But, a thorough audit revealed 11,000 potential leaks in two weeks. All the scarecrows you could imagine were hanging on posts all across the organization. They weren't enough. Preventative security doesn't always get the job done. Many organizations would benefit from real-time audit and monitoring solutions. In addition to after-the-fact forensic and audit trail benefits, active monitoring can be a powerful deterrent and even enable real-time remediation. It has some interesting data on the risk posed by insiders. Specifically, they look at the difference between risk from malicious attackers and the risk posed by unintentional breaches or well-intentioned employees (the 'Soft' Insider Threat). "CXOs also revealed that the greatest financial impact to their organization was caused by risks related to out-of-date or excessive access rights"
I was surprised by that. I intuitively know that soft breaches occur far more often than malicious attacks. But, my intuition also tells me that malicious attacks probably cause far more extensive financial harm. The respondents of this survey tell us that inappropriate permissions lead to greater financial harm than malware, internal fraud, deliberate policy violations, and unauthorized access (among others). You should look directly at the data. It does vary by country. In the U.S. (where the greatest financial losses were reported by respondents), internal fraud edges out excessive rights, but I'm still surprised to see the financial impact of each is almost equal. And keep closer watch on contractors and temporary employees! The SANS Institute recently published a document discussing Universal Serial Bus (USB) drives (also called Thumb Drives, Flash Drives, or USB Keys) and their implications on enterprise security. It's a good overview of the basic threats, types of attacks, as well as common risk mitigation strategies. Despite the lame title, if you're trying to make sense of the threat posed by flash memory drives, it's worth a look. Of course, if you're already a security guru, you can give this one a pass.